Former world heavyweight champion Tyson Fury during the press conference at the Four Seasons Hotel, London. Tyson Fury will fight for the first time in nearly three years when he returns to the ring in Manchester on June 9. 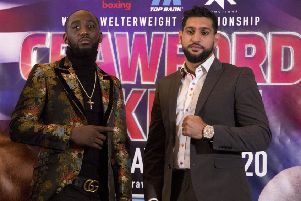 The former world heavyweight champion has signed with promoter Frank Warren, who announced the Manchester Arena fight on Thursday. The opponent for Fury has yet to be revealed. Fury has been preparing to return since January, when the suspension on his boxing licence was lifted. He last fought in November 2015 when he outpointed Wladimir Klitschko to win the IBF, WBA and WBO titles. Fury accepted a backdated two-year ban from UK Anti-Doping in December. He was charged with testing positive for a “prohibited substance” in June 2016 but said that was as a result of eating wild boar. Fury said he believes Deontay Wilder is “top of the pile” of the current crop of heavyweights but insisted “they’re all very vulnerable and very beatable too”. He said he and trainer Ben Davison have been “working very, very hard, seven days a week” to build up fitness after Fury piled on weight during his lay-off. And Fury dismissed the theory he may have been frustrated to be away from boxing while Anthony Joshua has stepped into the spotlight and become the WBA, IBF and WBO belt holder. Fury quipped that he could come back, take on a unified champion, land all the heavyweight belts and retire, but a world title fight is clearly some way off. Warren said Fury would need “three or four fights” before being ready to take on the best in the business. “He’s going to be busy. He needs to get some rounds under his belt,” Warren said.